Dr. Clark is an Assistant Professor, Department of Radiology/Nuclear Medicine, Wake Forest University School of Medicine, Winston-Salem, NC. More recently, endocrine surgeons are being trained to perform an even less invasive surgery that is generally called minimally invasive parathyroidectomy (MIP). Although techniques may differ among surgeons, a recent survey showed that 59% of endocrine surgeons are performing a minimally invasive procedure. This often means an incision as small as 2 cm, placed for optimal intraoperative localization with minimal dissection and palpation required. Most of these procedures are performed under attended local anesthesia and can be performed on an outpatient basis. 1,3 Figure 1 illustrates incision sites for both of these surgical methods. Accordingly, radiologists must provide optimal preoperative localization for these less invasive surgeries. Scintigraphic protocols should be tailored to the type of parathyroidectomy performed. For example, many imaging strategies employed for general lateralization prior to unilateral neck exploration are insufficient for MIP. This article reviews the anatomy of parathyroid adenomas, analyzes imaging strategies for unilateral neck exploration and MIP, and presents illustrative cases. The most common cause of primary hyperparathyroidism in ambulatory patients is a solitary parathyroid adenoma. Biochemical evidence of this disease includes elevated serum calcium in the face of normal or elevated parathyroid hormone levels. Most commonly, parathyroid glands are found posterior to the thyroid lobes, 2 in a superior location and 2 in an inferior location. 4 Most are located outside the thyroid capsule, or extracapsular. However, parathyroid glands can be located beneath the thyroid capsule in a subcapsular position. Additionally, they can be entirely encased in thyroid parenchyma, or intrathyroidal. When ectopic, parathyroid glands can be located from the carotid sheath to the mediastinum to the inferior aspect of the heart. Technetium-99m (Tc-99m) sestamibi and Tc-99m tetrofosmin are commonly utilized tracers for dual-phase parathyroid scintigraphy. These tracers localize in the thyroid gland as well as in parathyroid adenomas. 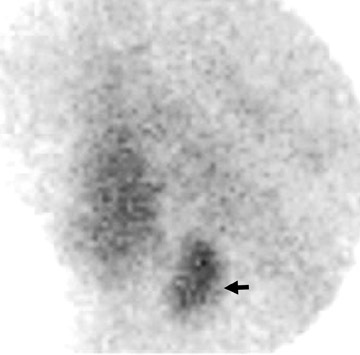 This makes correlation of the adenoma in relation to the thyroid gland possible on planar as well as early single-photon-emission computed to-mography (SPECT) imaging. 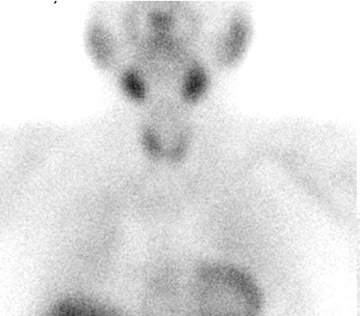 Differential washout of the radiopharmaceutical from the thyroid allows for delayed imaging that often delineates a parathyroid adenoma. 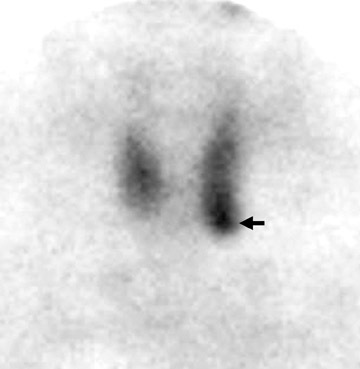 Thyroid-specific imaging with Tc-99m pertechnetate and I-123 can also be employed using a subtraction technique to differentiate parathyroid from thyroid activity. Imaging protocols should be adapted to the type of surgery performed by endocrine surgeons at your center. Several imaging goals that must be considered are discussed below (Table 1). All imaging protocols should contain anterior planar images from the ears through the inferior border of the heart to screen for ectopic adenomas, which can be located anywhere from the carotid sheath to the inferior cardiac border. Figure 3 shows an anterior planar image of the neck and chest. Many imaging protocols utilize anterior images obtained with a parallel-hole collimator. This image provides an overview of the entire neck and chest. Further imaging with SPECT would be necessary for optimal three-dimensional localization if an ectopic adenoma is discovered on this image. If no ectopic adenoma is identified, more focused images of the neck are required. The perithyroidal region should be interrogated with converging and lateral pinhole images for the most complete examination. 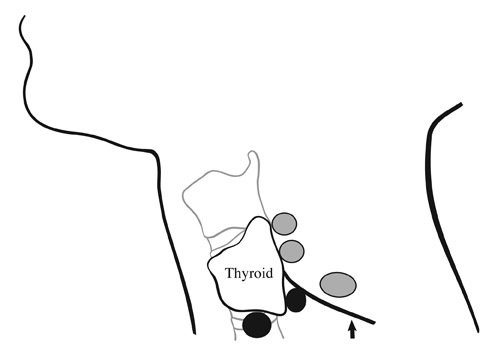 Many surgeons perform unilateral neck exploration (UNE) based on parathyroid scintigraphy directing the exploration posterior to the right or left thyroid lobe. Parathyroid scintigraphy has been found to have an approximate 90% lateralization success for this type of surgery. 5,6 In general, anterior images over the thyroid on a dual-phase protocol are used for correct lateralization. Lateral pinhole images over the neck are also recommended, as additional information can often be gleaned from these images. For example, the depth of the adenoma within the neck (eg, in the tracheoesophageal groove) can be reliably demonstrated on these images. Figure 4 presents a case of anterior images being insufficient for correct lateralization, with lateral pinhole images demonstrating the adenoma. Single-photon CT images can also provide this information, although SPECT may be superfluous (and time-consuming) if the lateral pinhole images are sufficient. The decision to perform MIP is based on normal anatomic findings in the neck: Inferior parathyroid glands are invariably located ventral to the recurrent laryngeal nerve, which is rarely anomalous. Therefore, the surgical incision for inferior and superior parathyroid adenomas differs to accommodate optimal intraoperative localization without crossing the anatomic plane that this nerve delineates (Figure 2). This minimizes dissection and reduces potential recurrent laryngeal nerve damage. Additionally, dissection across the plane of the thyrothymic ligament in this region can be difficult. Superior and inferior adenomas can be found in various positions in relation to the posterior aspect of the thyroid gland (Figure 2), as seen on lateral pinhole images. Interestingly, superior parathyroid glands can fall posteriorly and inferiorly when extracapsular and enlarged. Because these lie in the same axial plane on planar images, these superior adenomas are often mistaken for inferior parathyroid adenomas when anterior-only planar images are obtained on scintigraphy. Valuable information can often be gleaned if lateral pinhole images are obtained, such as depth of the adenoma within the anteroposterior plane. If lateral pinhole images localize the adenoma adequately, SPECT imaging does not need to be performed. What appears to be an inferior parathyroid adenoma on anterior images turns out, on lateral images, to be a superior adenoma that is displaced posteriorly and inferiorly (Figure 5). With the MIP performed at our center, this inadvertent call leads to a larger incision, increased dissection, longer operative time, and often creates a need for general anesthesia. Many authors advocate the use of SPECT imaging for optimal localization, particularly for localization within the anterior/posterior plane. 7 Several authors directly compared anterior planar views with SPECT and found that SPECT further increases the sensitivity of scintigraphy. 8-10 However, lateral pinhole images are not included in their protocols. At our institution, the addition of 2 lateral pinhole planar images over the region of the thyroid increases total imaging time by 20 minutes. Compared with SPECT imaging at approximately 45 minutes, we find that lateral images provide anterior/posterior localization without the added imaging time, cost, and the patient compliance issues related to the use of SPECT. However, if no adenomas are localized with early anterior and lateral planar scintigraphy, immediate SPECT imaging should be employed for possible identification of a small adenoma (whether perithyroidal or ectopic), an adenoma that is being attenuated by the tracheoesoph-ageal groove, or an occasional adenoma that is not localizable without the improved contrast of SPECT. Poor or no uptake in an adenoma on planar imaging is a common indication in the literature for SPECT. 7-10 Early SPECT imaging, particularly before tracer has washed out of the thyroid, allows for localization of an adenoma in relation to the thyroid, which is useful for surgical planning. 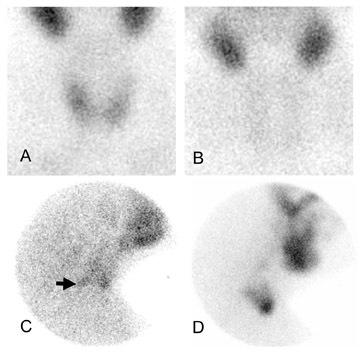 Thyroid-specific radiopharmaceuticals, such as Tc-99m pertechnetate and I-123, can delineate the thyroid parenchyma if needed after dual-phase imaging. This is helpful as a second-line "visual subtraction" method when no parathyroid adenoma is apparent on dual-phase parathyroid scintigraphy. 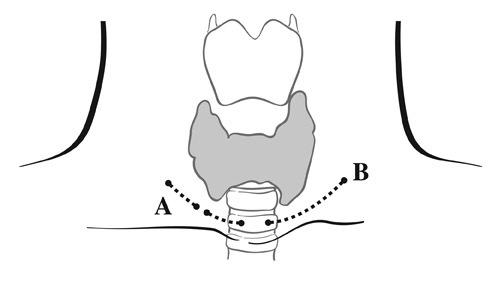 Unilateral cervical exploration and minimally invasive parathyroidectomy after preoperative localization with parathyroid scintigraphy have replaced bilateral neck exploration for primary hyperparathyroidism at many medical centers. Depending on the type of surgery performed, scintigraphic imaging protocols can be tailored for optimal preoperative localization. Screening for ectopic adenomas with anterior planar images over the neck and thorax is prudent. Planar images that include anterior converging and lateral pinhole images over the thyroid provide lateralization as well as anterior/posterior localization. Single-photon emission CT is indicated if planar images are unrevealing. Parathyroid scintigraphy: Optimizing preoperative localization. Appl Radiol.